Teacher Ric Thuma and Dr. Madsen will be hosting several PolarConnect events over the duration of their stay in McMurdo, Antarctica. For more information and to register, fill out this form. The circuit board of the cosmic ray detector. Photo by Juan Botella. Neutron monitors are used to study cosmic rays, and indirectly the sun, which occasionally undergoes solar storms that produce bursts of energetic particles. We are interested in learning more about the energy range and abundance of the particles produced in these events, which is important for understanding how to protect electronics and the electrical grid from extreme space weather events. The McMurdo deployment will involve dismantling two neutron monitors and if possible, the South Pole deployment will be to perform routine maintenance. McMurdo Station, Antarctica. Photo by Tim Spuck. 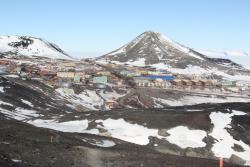 We will be staying at McMurdo station, and working at the CosRay building, which is a short hike from the station, just beyond Observation Hill. The neutron monitor project is the longest continuously running experiment in Antarctica. The neutron monitors will be reassembled and continue operating at the Korean Antarctic base Jang Bogo. One neutron monitor station formally at CosRay was redeployed at Jang Bogo in December 2015 so this project will maintain a continuous data record in Antarctica starting in 1961. Presentation prepared for the Rochester Community Schools Board of Education related to the PolarTREC 2017 Neutron Monitors for Solar Study expedition. Local news source in Rochester, MI covers the deployment of Eric Thuma to McMurdo Station. This is a suite of labs created by Michigan State University and the Joint Institute for Nuclear Astrophysics (JINA). It provides a number of lessons and activities in nuclear physics. It can be used to demonstrate the types of reactions typical in cosmic ray interactions and the interactions that the CosRay neutron monitors depend on. The Energetic Ray Global Observatory (ERGO) is a program that will provide students and teachers with a small detector that is capable of detecting the cosmic rays in a manner very similar to CosRAY and IceCube. 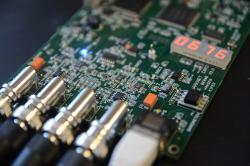 The unit is small and will allow data to be exported automatically to Google Maps. Plans for the Berkeley National Laboratory cosmic ray detector. This detector can be built by high school teachers and can be used to study cosmic rays in a method similar to the antarctic particle studies (CosRAY and IceCube). Background on the IceCube Neutrino Observatory. Eric Thuma has been teaching in Rochester, Michigan for 19 years. He has had the pleasure of teaching physics, astronomy, and geology during that time. Eric has also been teaching Astronomy at Macomb Community College since 2014. He graduated from Michigan State University with a degree in astrophysics and holds Master’s degrees in Education and Astronomy. Recently, he has worked as an educator researcher for NASA’s Science Mission Directorate. His enthusiasm for sharing research with students is what has led him to seek out the PolarTREC experience. My family now proudly owns the Fuel Mule. Well my project involved direct collaboration with South Korean Researchers. We were moving the CoRay neutron monitors to a South Korean station called Jang Bogo.